It is among the most dire warnings ever issued by the Bulletin, whose board of sponsors includes 15 Nobel laureates. Not since 1953, when the United States and Soviet Union both began hydrogen-weapons testing, has the clock been moved so close to the final hour. So, what can we learn from this? Well, first off, we can learn that being a Nobel laureate doesn't necessarily make you smart or wise. Notice that the last time the world was "this 'close' to total destruction" was... ahem... 65 years ago. That was "two minutes to midnight." Thus, one way to look at this would be to draw the conclusion that "two minutes to midnight" equates to at least 65 years. Probably longer, if the world manages to again fall short of "total destruction" this year (I'm guessing it will -- the world has long been a massive underachiever. Even before the Millennials.). We don't have the second data point. Actually, even the first data point is somewhat uncertain, but that's irrelevant -- because we don't even have something that can come close to approximating the second data point. For example, we don't know what happens "right before Doomsday." We don't know what happens a few decades before Doomsday. We don't know anything, really. Which makes this Clock nothing more than incredibly blind speculation. How would, or could, we know what time the clock should actually be set to? Obviously, we can't know -- except in hindsight. At which point, it's a pretty useless clock ("Hey, just though you surviving cockroaches would like to know, it's ten past midnight on the Doomsday Clock!") Maybe it's presently more like 6:18 in the morning on the Doomsday Clock, and we're just scaring people for no good reason. After all, few (if any) of the scientists who set the clock to "two minutes to midnight" last time lived to see their doomsday. Scientists, of all people, should know better. I guarantee that the same people who take this clock seriously are the exact same people who mock the Doomsday cultists who run around telling everyone that "the Earth will end on September 21," etc.. And they should mock those predictions! But they should also realize that they themselves are doing the exact same thing. "Hey, we here at the Bulletin of the Atomic Scientists are really worried again. How worried? As worried as we were 65 years ago! Yes, we know that everything turned out okay then... stop reminding us. Yes, we know that we're scientists and not psychologists -- and that psychologists would probably be much better-suited to the task of figuring this stuff out, given that human action is more of a key ingredient to nuclear war than technology. Look we're just really worried. And it makes us feel better to make YOU feel worse. Feeling like we're scaring people into (hopefully) behaving more responsibly helps us alleviate some of the guilt we still feel about inventing atomic weapons. Sorry!" This Doomsday Clock reminds me of the analysts who were calling for Doomsday to the Bull Market back in, for example, 1995. Many analysts then would have set their "Bull Market Doomsday Clocks" to one or two minutes to midnight... and then watched the market advance relentlessly higher, while they awaited their doomsday, which finally arrived years later. Some of us learned from that experience. Some of us, clearly, did not. Consider this: Those who were calling for a bear market in 1995 were 5 years early, and we razz them for it. The scientists who were warning of Doomsday last time were 65 years too early. And counting! (But who's taking these scientists to task? Just me, apparently?) I guess it's a win-win for them: If nothing happens, they just set the clock backwards and say, "Hurrah, catastrophe averted." But were we ever really that close to catastrophe to begin with? There's just no way to know. Anyway, I think this is probably why stuff like this bothers me: I really feel like scientists are supposed to focus on objective facts (not their subjective fears) and be "smarter than the average bear" (see what I did there? It's a double entendre. Ha!) -- so it disheartens me that many of them are driven more by emotion than by logic. I guess humans gotta "human," but it's concerning that there's less and less objectivity around these days. Hey! Maybe we should start a Doomsday Clock counting down until The Total Annihilation of Objectivity. Since such a clock would, of course, only be our subjective opinion, it would be poetically ironic. Which Nissan would Liam Neeson lease if Liam Neeson leased a Nissan? Which Nissan would Liam and Lisa Neeson lease if Liam and Lisa Neeson leased a Nissan? Try saying that three times fast! But darn it, that's not what I'm looking for either... (rifles through pages) Okay, here it is! 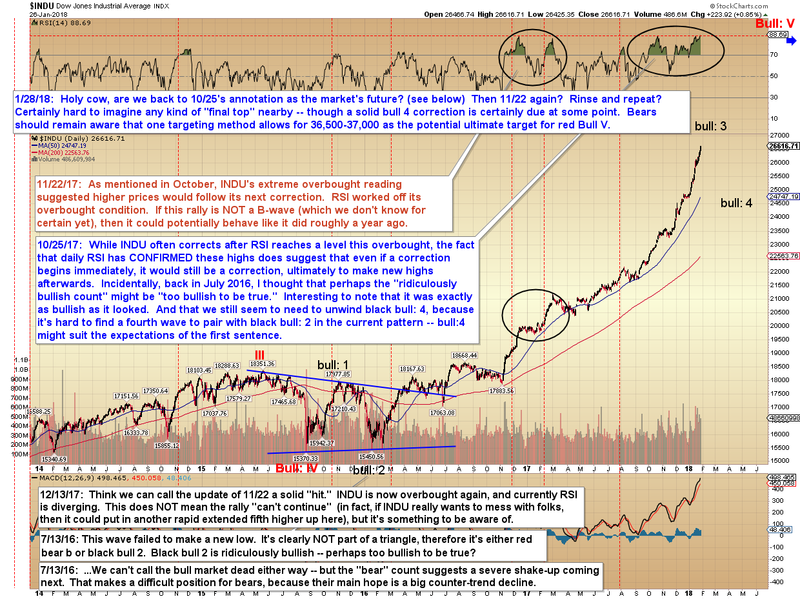 The Dow Jones (INDU) chart suggests that we may now have come full circle and be right back to where we were in October. 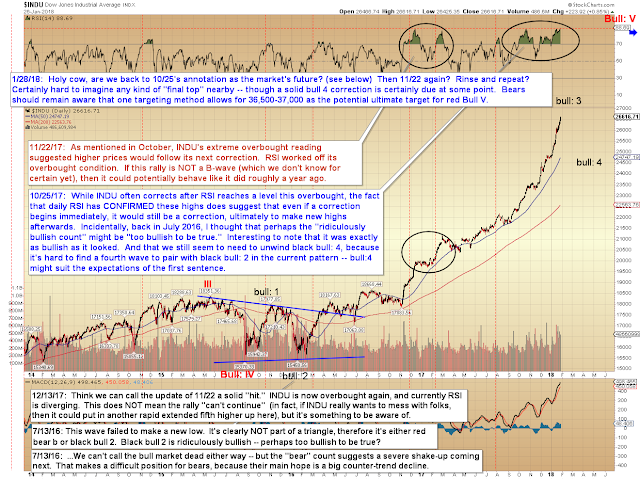 In conclusion, once again RSI is to the point where we might expect a correction soon, but it also appears that SPX and INDU probably both need at least one more near-term wave higher before the structure will allow for a completed wave. There's an off-chance for a complete structure already, but awaiting an impulsive decline has kept us from front-running into any trouble for the past few months, so we'll continue to utilize that tactic, and will continue to simply ride the trend until the market says we shouldn't. Trade safe.